Sydney, Australia - January 29, 2008 - Ortabe premieres NetFinder 3.0 to the world. Re-written from ground up, NetFinder hosts a number of never before seen features, lots more protocols and yet still just as easy-to-use as the Finder the day v1.0 was released over 11 years ago. NetFinder, is an advanced file management, syncing and automation tool with a Finder-like interface, supporting a number of internet protocols including ftp, sftp, ftps, webdav, http and file. Challenging itself on features in every major version released, NetFinder 3 enters its third major evolutionary phase beginning with a complete re-write from ground up using the latest technologies offered in Mac OS X. With a proven solid framework at its core, NetFinder continues to provide the core features of NetFinder 2, while offering a number of new, never before seen features which improves the ease, while removing the headache out of remote file management. 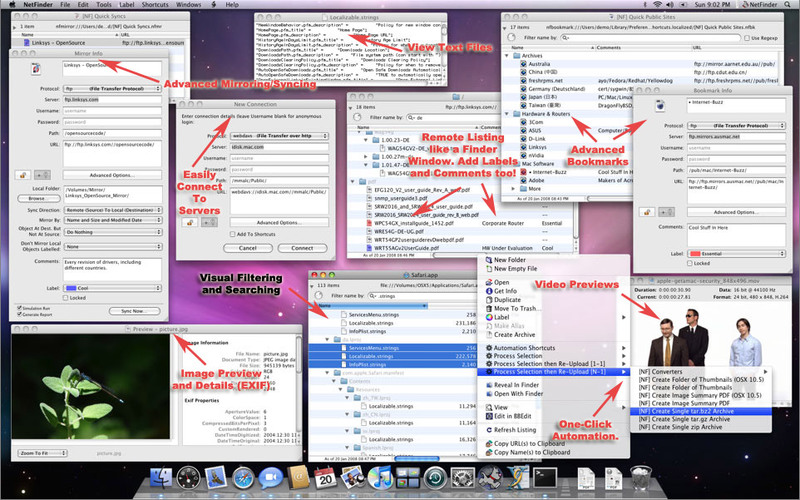 Some of the key new features include: the ability to label and add comments (like the Finder) to any file or folder on remote servers; undo accidental actions like moving, renaming and duplicating just to name a few; ability to visually filter hierarchical file listings; ability to create dynamic self contained filterable mirror reports; ability to easily transfer files and folders from any server to any other server by simply dragging and dropping from one window to another; simple to create user extensible automation components which allow complex actions to be performed on remote files with a single mouse click. All this and more can be performed when connecting to a server using one of a number of standard internet protocols including: ftp, sftp, ftps, ftpsi, webdav (including .Mac), http and local file browsing. With the ability to browse remote servers in a multi-window (or single window if preferred) interface like the Finder, renaming, copying, moving, deleting, duplicating, creating new files and folders, labeling, commenting, undoing actions and more, is easy. So easy that, if you know how to do it in the Finder, you will have no problems using NetFinder. NetFinder 3 requires Mac OS X 10.4 or later. A comprehensive list of features can be obtained from the Ortabe website. NetFinder 3 is available today from Ortabe for $35.00 USD per seat. A fully functional trial version can be download from the Ortabe website. Discount upgrade pricing is available for registered users of NetFinder 2.x and 1.x. Additionally, user who purchased NetFinder 2 on or after 1st December 2007 qualify for a free upgrade to NetFinder 3. Ortabe specializes in easy-to-use software solutions with advanced functionality. Based in Sydney, Australia, Ortabe was founded in 2007 by the developer of NetFinder, an advanced file transfer and file management tool since 1996. With over 12 years of experience developing software solutions in the global pre-press industry, the team at Ortabe is well aware of the need for software to be rich in features, while offering the highest quality in products and services, without overlooking the importance of listening to customer feedback, and so Ortabe is committed to continually delivering the finest quality software solutions to the Mac community.